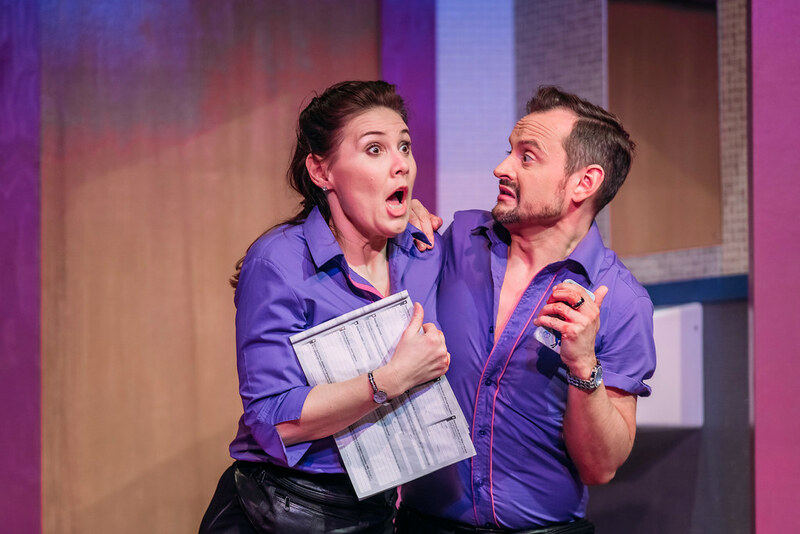 An hilarious new musical comedy about friendship, forgiveness and wishing for more at the Bingo brought to you by two multi-award winning Scottish theatre companies. Gie’s yer chat! 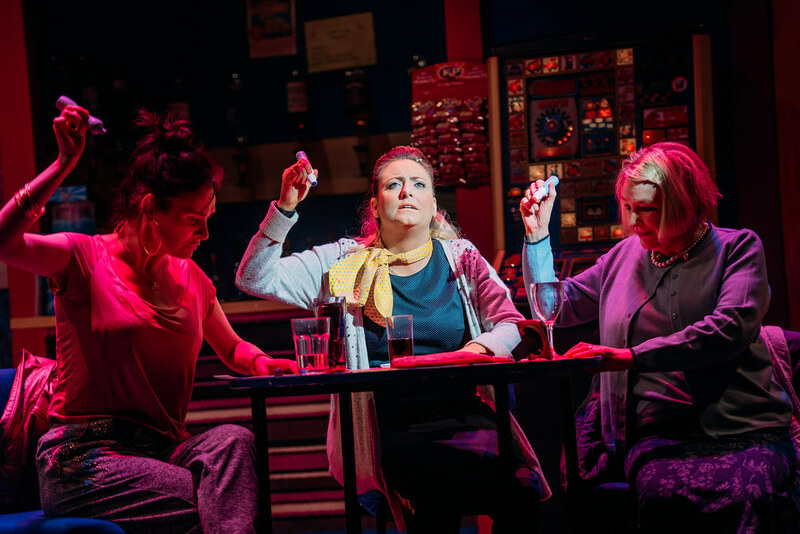 We’d love to hear what you thought of Bingo! What were your favourite bits? The song you can’t stop singing! Please contact Magda Paduch with any Press or Media enquiries. Grid Iron is an Edinburgh based new writing theatre company which specialises in creating site-specific and location theatre although they also produce work for the stage. Over their 22 years they have received 30 awards and a further 24 nominations covering all aspects of their work from acting, writing and use of music to stage management, design and technical expertise. Their adventures have taken them to extraordinary places; from the slopes of Edinburgh Zoo and the concourses of Edinburgh Airport to a massive oil-rig manufacturing shed in Dundee, a boat-builders island in a Norwegian fjord, to the former General Security building in Beirut, a working cancer hospital in Jordan, the old City Morgue in Cork, the largest climbing arena in Europe and parks, housing estates, playing fields, bars and stages all over Britain. 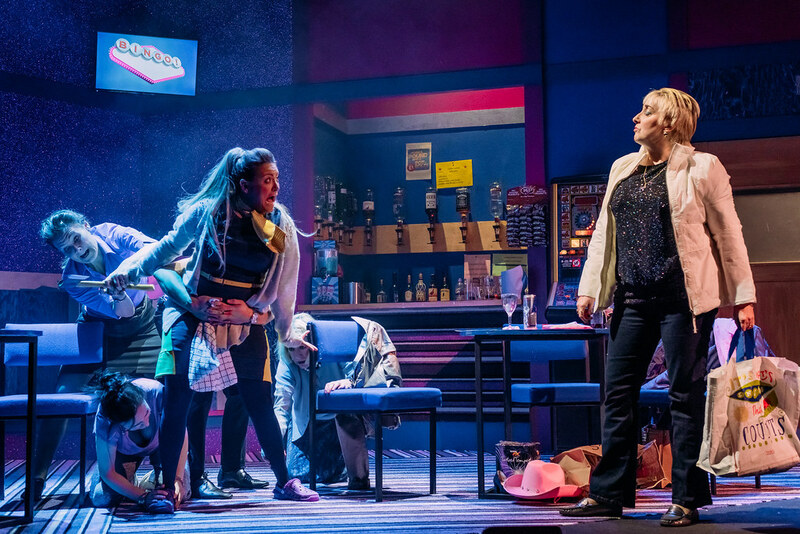 They have made co-productions with many partners including the National Theatre of Scotland, the Traverse Theatre, Dundee Rep Theatre, The Almeida Theatre, London and Lung Ha Theatre Company and have delivered two European Capital of Culture Commissions (Cork 2005 and Stavanger 2008). They have performed thirteen times at the Edinburgh Festival Fringe and twice at both Edinburgh International Festival and Edinburgh International Science Festival. They have also been part of Imaginate, Edinburgh’s international festival of performing arts for children and young people. "An all- round terrific night out that deserves a full house every night. "An unmissable highlight of this theatre season. 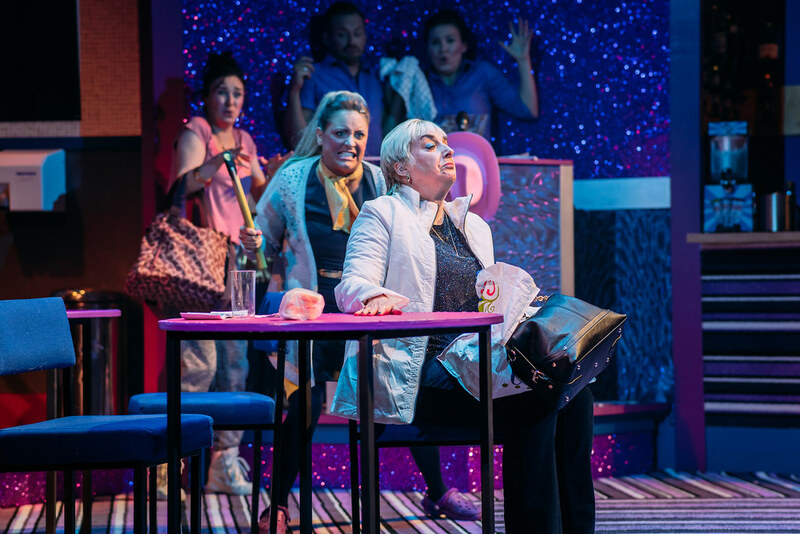 "Big laughs and touching moments galore, truly Scottish theatre at its best. "A hysterical performance that has the audience laughing out loud. "Quick wit, bawdy banter and bittersweet songs with panache and a sharp bite. Bingo! Extra Matinee performance added at The Tron, Glasgow! Anita has been an actor for over 25 years and recently began to write for Theatre, TV and Radio. 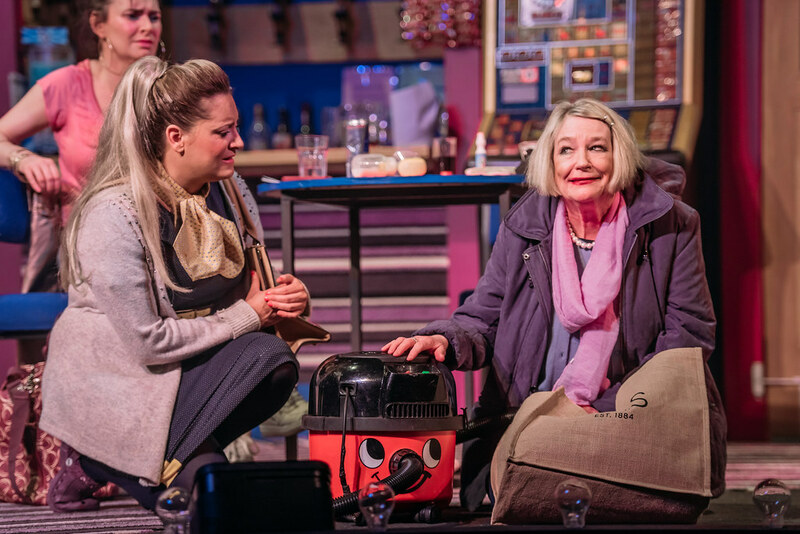 Her play Ringroad was nominated for best new play at The Critics Theatre Awards. She has since written, Happy Hour, News Just In/Hostage Taker and From The Air. Other work includes, Falling for BBC Radio Drama, several episodes for BBC’s River City and is in production with You Really Got Me Going as part of The Break season three for BBC. Anita continues to work as an actor. Johnny is a writer, director, actor and performer, as well as the joint artistic director of Random Accomplice Theatre Company. He has been described as the “new vanguard of pantomime” in the national press, having written 8 contemporary pantomimes. In 2015, he wrote Miracle on 34th Street for the Tron Theatre and wrote, directed and starred in The Little Mermaid at Macrobert Stirling. Recent credits include: Wendy Hoose (Birds of Paradise/Random Accomplice); A Perfect Stroke (Òran Mór/Traverse); Dear Scotland: The Balmoral Estate (National Theatre Scotland). Recent commissions include Royal Court Theatre, Macrobert and Tron Theatre. 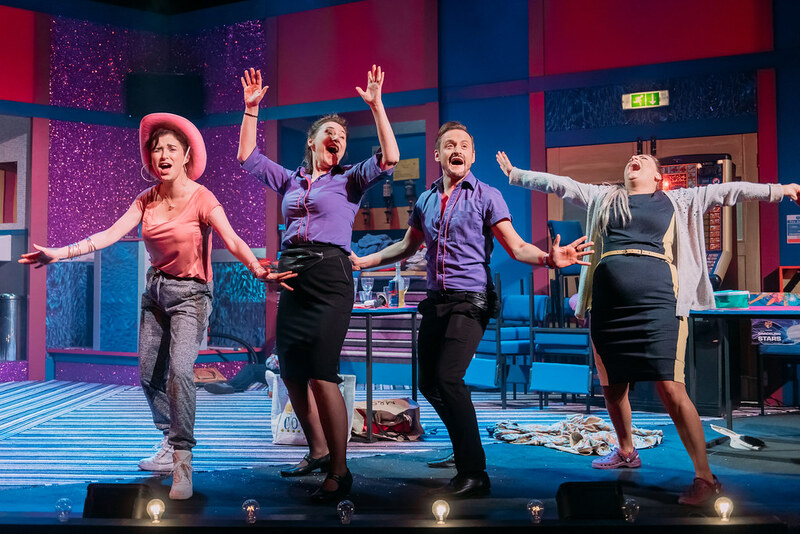 Additional credits include: Last One Out, Curse Of The Maccabra Opera House (Scottish Opera); Room 7 (Traverse Theatre); Little Johnny’s Big Gay Wedding (National Theatre of Scotland); Smalltown, Love Hurts, Double Nugget (Random Accomplice), Cinderella (Royal Lyceum Theatre). Alan Penman is an Edinburgh based composer, musician, musical director, arranger and producer. He is hugely experienced in taking song-writing and music workshops for all ages and abilities, and working on large scale community theatre projects. Jemima was appointed Artistic Director and Chief Executive of Stellar Quines in May 2016 recently directing The Lover, The Last Queen of Scotland and The 306: Day. Prior to that, she served as Artistic Director and as Associate Director at Dundee Rep Theatre for seven years. She trained at Queen Margaret University, Edinburgh and also on a Scottish Arts Council Director Traineeship. She has won and been nominated for a number of awards and directed more than 18 productions at the Rep, including Great Expectations, The Glass Menagerie, Time and the Conways, The Tempest, The Elephant Man and Beauty and the Beast. As a director and producer she has worked with a number of companies, including the Royal Lyceum Theatre, the National Theatre of Scotland, Perissology Theatre Productions, Borderline, Grid Iron Theatre Company, Traverse Theatre and Paines Plough. The Disappointed (BBC Radio Scotland). Her recent film works include Spores (Short Film Talent Network). Louise was trained at Arts Educational School London and has since appeared in a wide variety of stage and television roles. 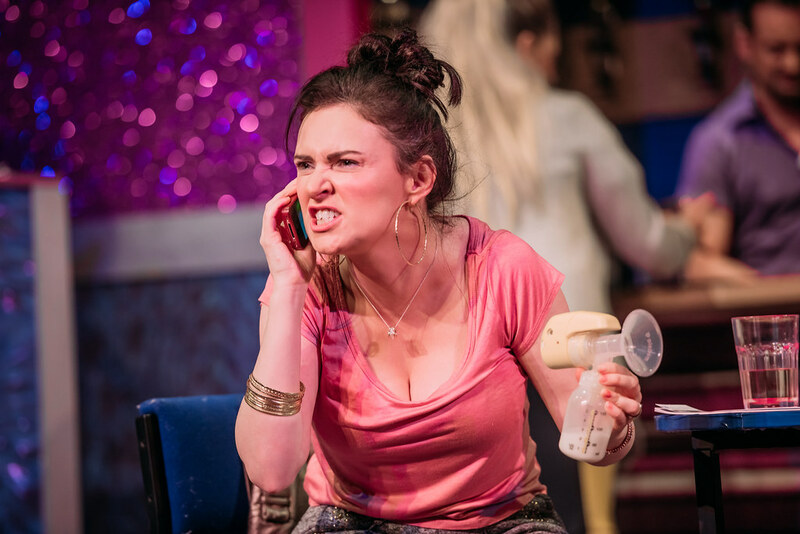 Theatre roles include Lisa in the West End production of Mumma Mia (Prince of Wales Theatre), Bernadette Rooney in Cuttin’ A Rug (Citizens Theatre), and Marissa in Yer Granny (National Theatre of Scotland). TV roles have included a dancer on X Factor, DC Andrea McGill in BBC’s Scot Squad and Nurse McGuire in the BBCs Two Doors Down. Wendy is an accomplished actor with experience across film, TV, stage, radio and commercial outlets. TV roles include Magde in BBC Scotland’s Still Game and Lola in BBC’s Fail. Film credits include Susan in Killing Me Softly and Sister Mary in Clingfilm. 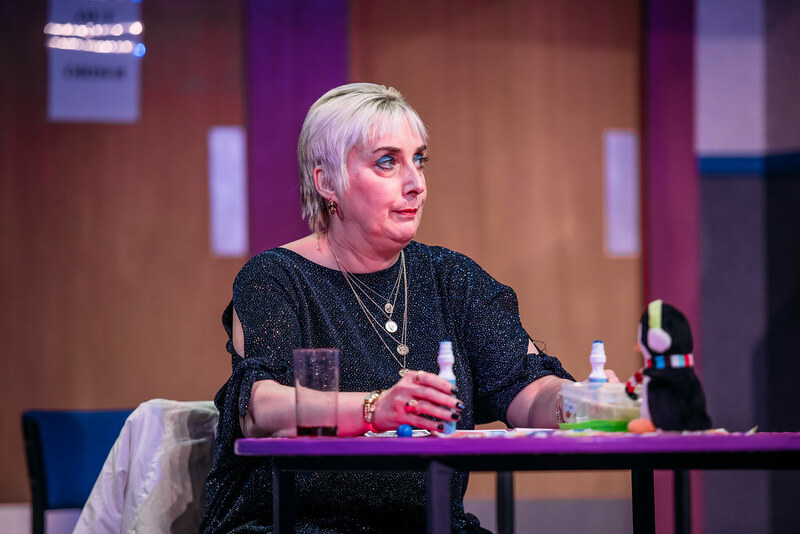 On stage Wendy has played Cathy in Descent (Oran Mor) and Sara in Bondagers (Royal Lyceum Theatre). She recently appeared as the Genie in Perth Theatre’s Aladdin at Christmas. Barbara has a wealth of experience in TV, Film and on Stage. 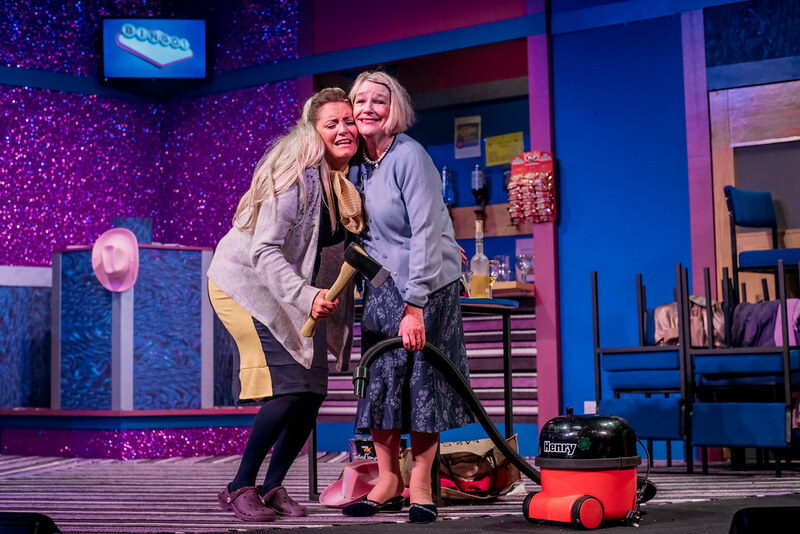 She has performed in stage shows of Chitty Chitty Bang Bang and the BFG, along with roles in the films The Last King of Scotland and Women Talking Dirty. Television credits include, Rab C Nesbitt, River City (BBC Scotland) and Brave New World (BBC). Jo is an accomplished actor with a list of stage roles to her name. Some roles include playing Joanna in Dear Brutus (Pitlochry Festival Theatre) and Liz in Sunshine on Leith (Dundee Rep). More recently, Jo played Oskar’s Mum in the US tour of Let the Right One In (National Theatre of Scotland). TV credits include Rhona in BBC’s River City, and DC Debbie Carroll in Doctors (BBC). Darren trained at The Arts Educational Schools London before moving on to Royal Scottish Academy of Music and Drama. He has performed in variety of stage roles, including Campbell Tunloch in Whisky Galore (Mull Theatre), Inspector Hearne/Thomas Clegg in Witness for the Prosecution (Dundee Rep) and Young Nijinsky in the UK tour of Nijinsky’s Last Jump (Company Chordelia). Also featured in BBC’s Still Game: Live and BBC Scotland’s Scot Squad. Jane was trained at Queen Margaret College in Edinburgh, and has since had a career in film, radio, TV and most notably on the stage. She has played Dolly in The Steamie (Tony Roper), Angelo in The Cameo (Oran Mor) and Alison in Mum’s the Word 2 (R C Kelly Productions). She was the star of Still Game as Isa Drennan and featured in Rab C Nesbitt. Jane also has a wealth of experience in pantomime, having performed in productions across Scotland for over 25 years. Deaf Theatre Club run by Inkblot Collective – Karen Forbes & Daniel Livingston who will be front of house at The Tron on 13 April. If you have any access requirements please contact the relevant venue box office. This is particularly important if booking for ASSEMBLY HALL as it is accessed by several flights of steep stairs and you will need directions to the accessible entrance.